Slept in and didn’t walk Mix until ten in the morning. Then came straight to the summer house where I spent the morning tidying the summer house and sorting out my accounts – it was long overdue. 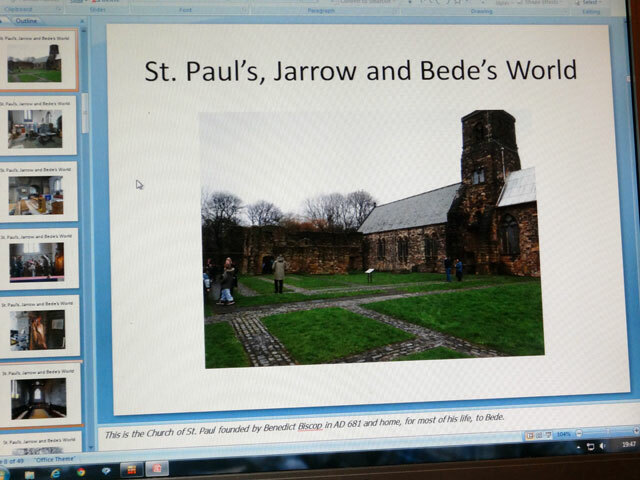 I then spent the afternoon preparing my presentation for the meeting of the Green Pilgrimage network in Canterbury. David popped in, he wanted to take a measurement off the boat trailer and then he was off to collect Sasha before driving to Newcastle to catch the shops. After dinner – it was one of my favourites: tomato soup, toad-in-the-hole, cauliflower cheese and fried potatoes – I went off to the station to collect Digger who had been in Edinburgh with his friend David watching Raith Rovers against Hearts at football. Back home Rachel and I watched an episode, or rather a film, in the Montalbano series, something which I always enjoy. Then it was time to walk the dogs. It was still very clear tonight. Last night we didn’t need our torches (other than if a car approached) because the moon was so bright and tonight was just as bright and clear. Haven’t mentioned Rachel except to say we watched Montalbano. Rachel spent most of today trying to clean up the lounge which has taken a hammering because of all of the mud which the dogs bring into the house on their paws. It can’t be helped but it is quite demoralising how quickly a clean room can become the opposite after the outside door has been open for only a moment or two.